Martha Berry thanks Mr. Holt for the cards he sent and says that they are enjoying them. She thanks him for sending Paul Culbertson back to Berry and informs him that Paul graduated with his class. She says that she was unable to attend Commencement, but that she was glad that Paul graduated and that the class was a great one. She tells Mr. Holt that she is slowly improving, thinks about him often, and hopes that he will visit more. She then thanks Mr. Holt again for sending Paul back to Berry. 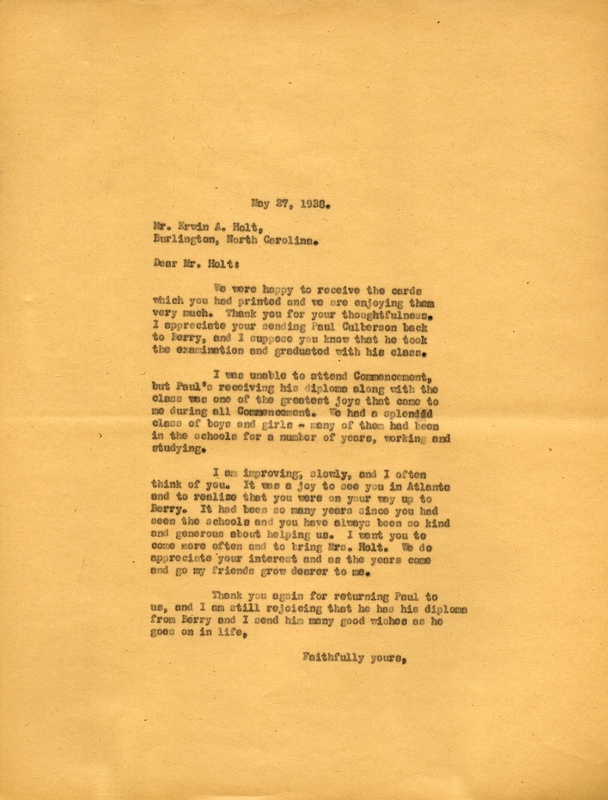 Martha Berry, “Letter to Erwin A. Holt from Martha Berry.” Martha Berry Digital Archive. Eds. Schlitz, Stephanie A., Cassie LaJeunesse, Jessica Hornbuckle, et al. Mount Berry: Berry College, 2016. accessed April 20, 2019, https://mbda.berry.edu/items/show/14654.